Are you looking for the best resources to get free blog content for your website? Then, you’re in the right place. We know how important it is to keep a regular publishing schedule. And we understand the struggle to make time to create high-quality content for your website can be an uphill one. 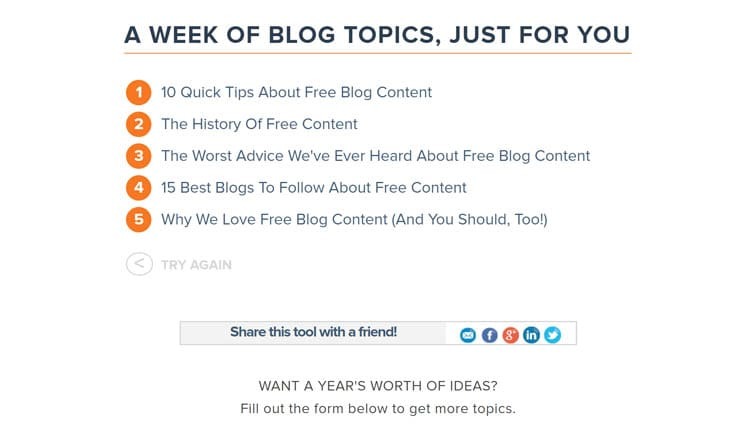 In this article, we’ve compiled an ultimate list of all of the best tools, ideas, and resources you can try to get free content for your blog. Now, that's quite a lot to cover. But before we continue, let’s define what we mean by free content here. 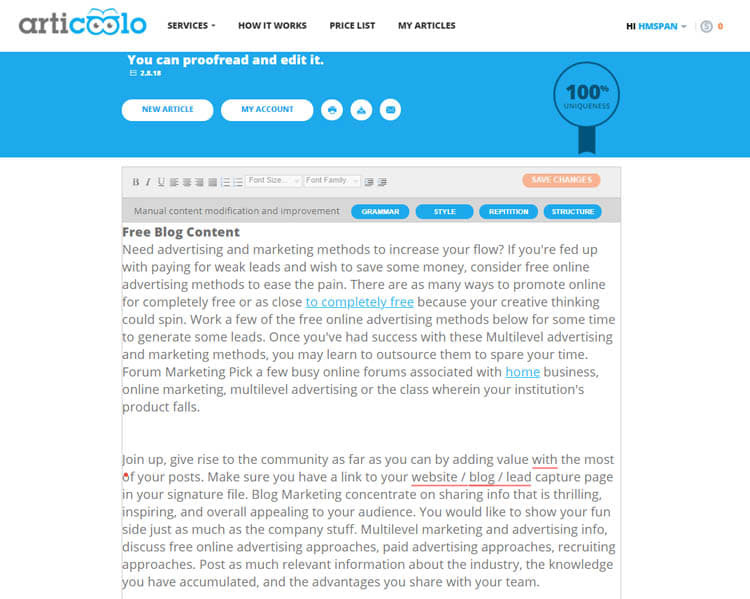 Basically, free content in this article will mean content that you can use for your blog. It can be in any media—text, image, audio, or video. They will cost you next to nothing—or nothing at all. The only difference is the time investment you need to put in to produce the results. Where and when to use free blog content? Before we move forward, we want to make sure you don’t go down this road without knowing what’s in store for you. First, you need to ask: what will you use free blog content for? The answer is: definitely not for your Tier 1 pages. If you are looking for free blog content, one of the best ways to use them is for your tier 3 pages. It just means that a website should typically divide all its pages into tiers. Tier 1 pages are your top landing pages. These are your high-priority money pages expected to convert, get traffic, and rank for your target keywords. Lower down are your Tier 2 pages. They do pretty well, and these pages should all direct their own traffic by linking to your tier 1 pages. Finally, there are Tier 3 pages. These are the ones that get the least views but are typically more in number. These should direct their traffic by linking to Tier 2 and 1 pages. Learn more about how a tiered site architecture works. Now to reiterate: NEVER use free content for your tier 1 pages. Free content are not detailed, comprehensive, and high-quality enough to fit the standards needed for a Tier 1 page, and using them can end up harming your site. So let’s get that message very clear. 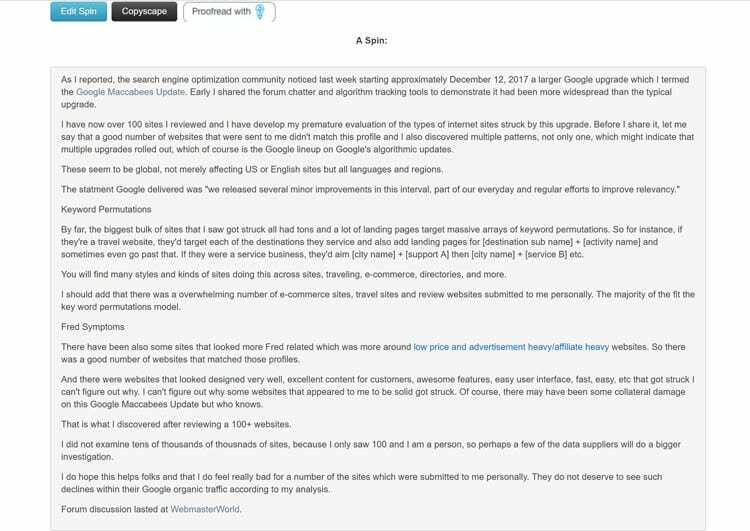 Basically, if you need some short pages built to describe some feature updates on your tool, new products you just launched, answer some frequently-asked customer questions, or quickly address a new minor Google algorithm change, then you’re looking to build Tier 3 pages. But if you’re looking to rank against competitors, get more leads, and convert those into sales, you’re looking to build Tier 1 pages, and you need to do more than push a few buttons to generate a free article or post a call for bloggers to come sending you with free material. If you look at top content from Neil Patel, Brian Dean, or Rand Fishkin, you’ll see that everything they produce took time in terms of research, preparation, writing, editing, and design work before they hit publish. This level of effort is something you can’t simply get for free. It’s either you spend all that time and effort yourself, or you hire professionals who will personally study your needs to give you bespoke, higher-quality, strategic content that will actually make a difference for your business. But if you’re just looking for free blog content to build Tier 3 pages, then we can help you with that, too. 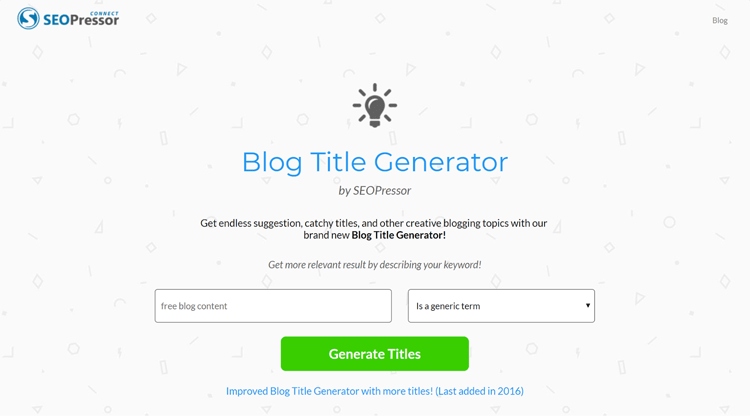 SEOPressor is a WordPress plugin with a nifty blog title generator. Below, I gave it a try. When I typed my topic “free blog content,” for example, here are the topic/title suggestions that I got. And guess what? It’s not the only topic and title generator on this list. 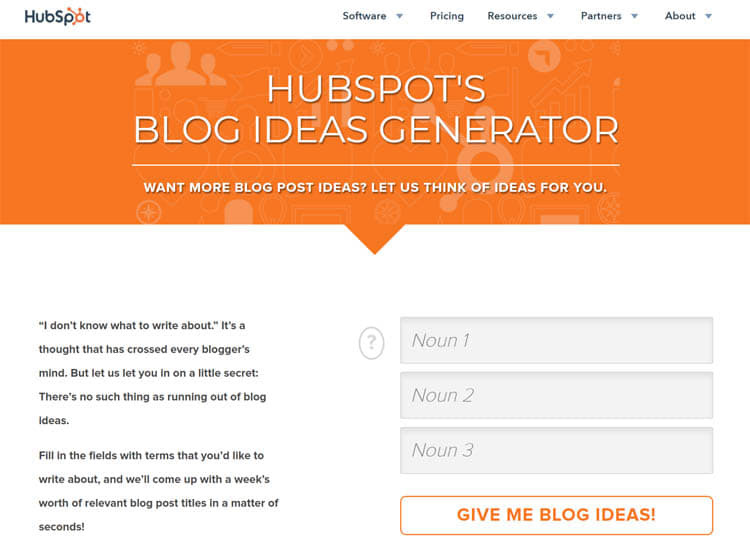 Inbound marketing pioneer HubSpot also has their own blog topic ideas generator. This time, instead of typing your keywords, you need to type three different nouns into the form field. HubSpot’s content generator will then spin some topic/title ideas out of those. The results are not bad here either! In fact, they actually make for some pretty interesting topic ideas. Got no complaints about the title structure as well. Of course, it’s not always this perfect. As you know with automated tools, you’ll still need your human eyes and common sense to tell whether the results you’re served with actually make sense. 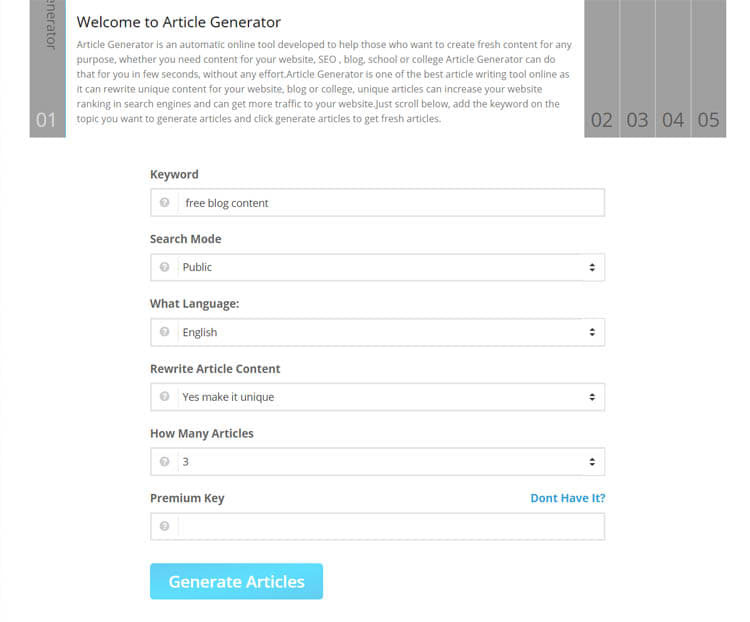 Now, it’s time to see what article generators can do. 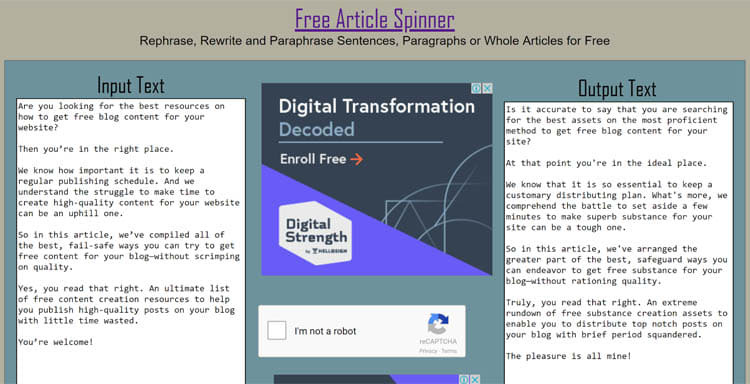 The Free Article Spinner will spin new content for your for free, from sentences to a whole article. Below are some tries I had with the tool. The end result actually looks funny and almost unusable, so you’ll still need approximately between 30 to 90 minutes of editing to make it viable. Remember, it’s free blog content, so you’ll have to make the most of what you’ve got. 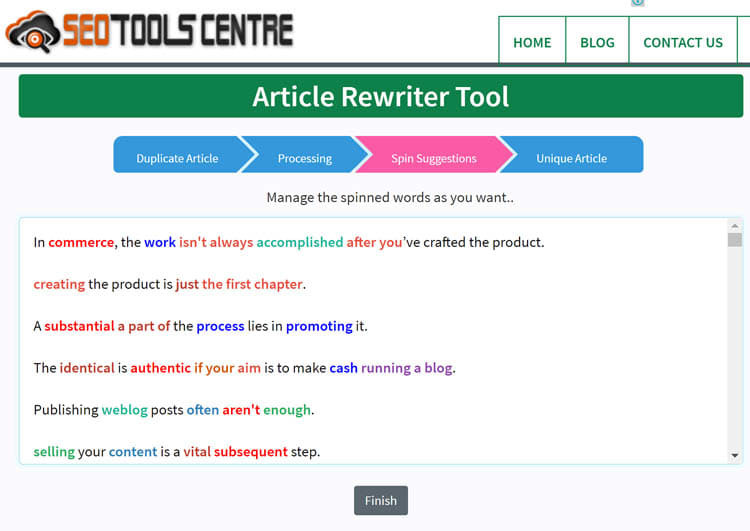 The Article Rewriter from SEO Tools Centre works much the same way as a regular article spinner. 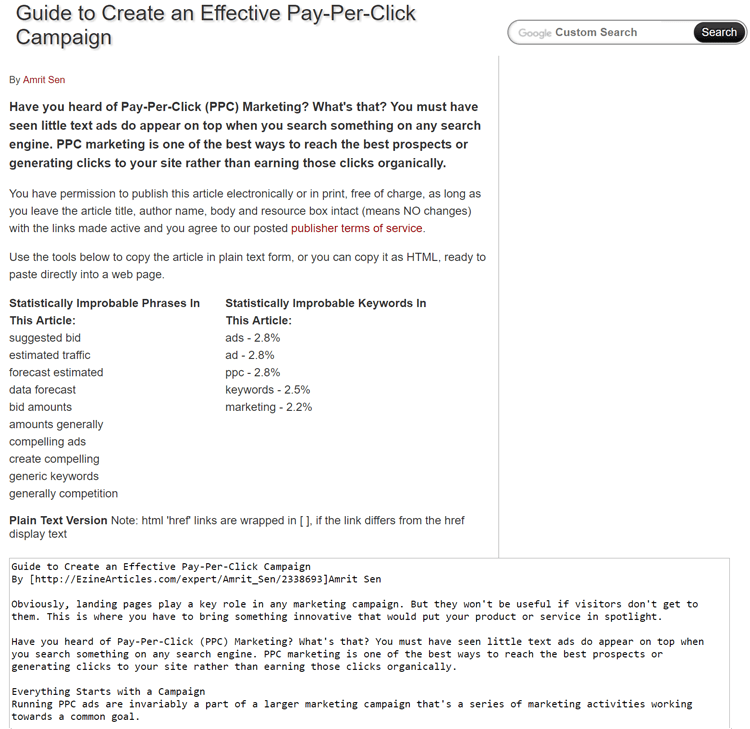 Below, I tried pasting the text of one of our blog posts on content promotion. Just click “spin,” and the tool generates spin suggestions. 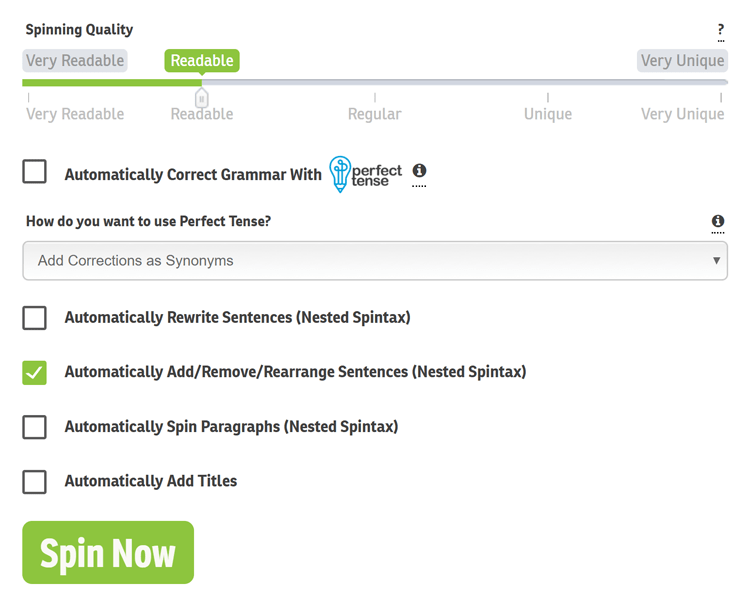 The highlighted words contain the spin suggestions. Just click and decide which ones are fit to use. To be honest, it can actually produce an okay spun article if you take time to go through each spin suggestion. Nothing to write home about but again, it’s free, and it’s quick. Which are good things if you’re looking to build a mass of good articles quickly. If you’ve come across once infamous sites like About.com and eHow in their heyday before their rebranding, you may be familiar already with what content directories are. Basically, they’re content farms where tons of articles get produced. Some of these articles are reusable while some need to be bought. And what is a PLR article? Simply, PLR stands for private label rights. This is a special type of license where you can purchase an article and legally edit or publish this as your own, even with your own byline. However, there are some cons to PLR articles, as John Chow warned in his blog post. “There is a huge quality difference between articles produced by a professional and one written for private label rights. Another thing to keep in mind is most PLR resellers will sell their articles to anyone and everyone. So keep these in mind before taking the leap. As always, use sparingly, and never on the top money pages you’re looking to rank. eArticles online is an article repository. Writers post content and websites looking for free content may choose from the several categories available and republish the content on their site, provided the credit goes to the original author. 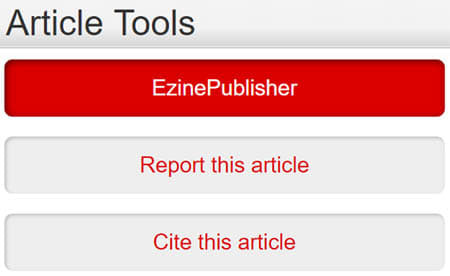 EzineArticles is also a content directory with a category section and expert writers. What makes EzineArticles a convenient option is that, at the bottom, it has a publisher or cite option that opens clean text and html copy that’s ready for copy paste. Take note that what you’re getting may not be unique to your site alone, though. 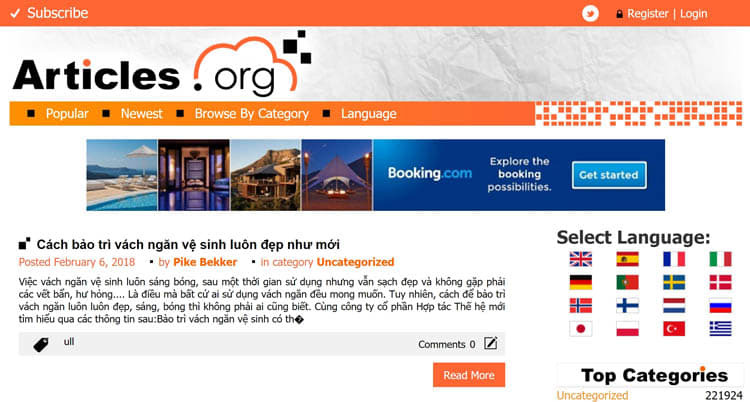 Other publishers are allowed to syndicate the same content on their site. 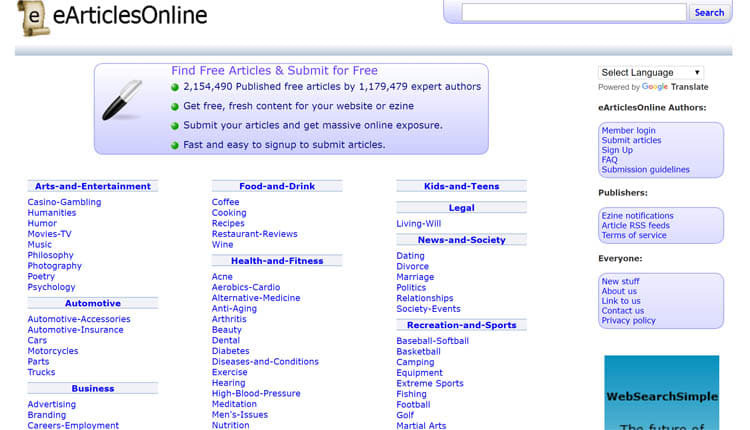 Another free online article directory, Articles.org currently only has hundreds of articles in their categories. The plus? They also have articles in other languages. The catch? They have this section in their terms and conditions page. It kind of says that they’ll store your IP address and track your online activity. 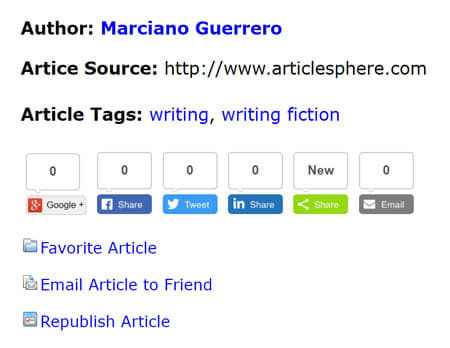 Owned by Singaporean marketing entrepreneur Larry Lim, ArticleSphere.com is an “online one-stop source of quality content” and a “free article directory” for anyone looking to syndicate free content on their websites. 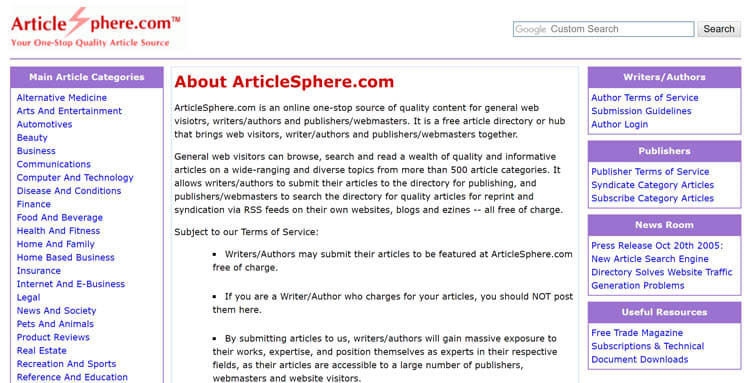 ArticleSphere only accepts articles in English and, compared to other directories, are not as lenient with their writer rules. They reserve the right to edit or remove any articles that they believe need to be updated to fit their editorial guidelines. The only allowed way to republish any of their content to your site is to use their “Republish” button. The one thing that could be a tad distracting about this site though is the presence of annoying ads. If you don’t mind clicking away from more than a few, then check this resource out. 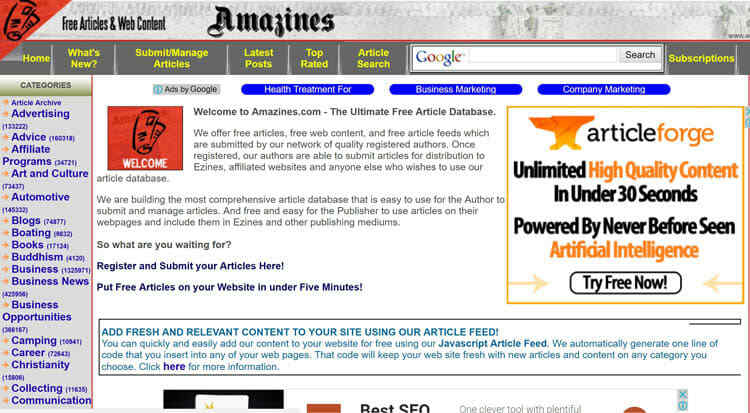 Amazines has thousands of current articles in its online directory. You’re free to check and republish any content provided that you only copy and paste to your website using their script. Another plus? Amazines also have articles in other languages. BloggerLinkUp will let you subscribe to their list, and you would get an email each Monday, Wednesday, and Friday. 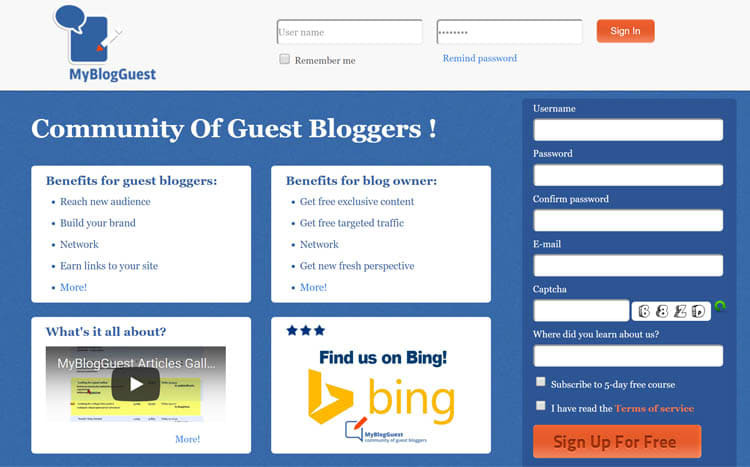 It’s basically a newsletter and listing that connects bloggers and blog owners looking for guest posts. These emails will list bloggers looking for expert sources, requests for guest posts, bloggers and webmasters offering guest posts, and PR reps and others seeking reviews of products. Bloggers post some details about their ready-made articles looking for a home, blog owners post a call for guest posts to their sites along with a snippet of their guidelines, etc. When you see a request that you can fulfill, just respond directly to the requester. Update 2018: This is what Blogger LinkUp looks like now. 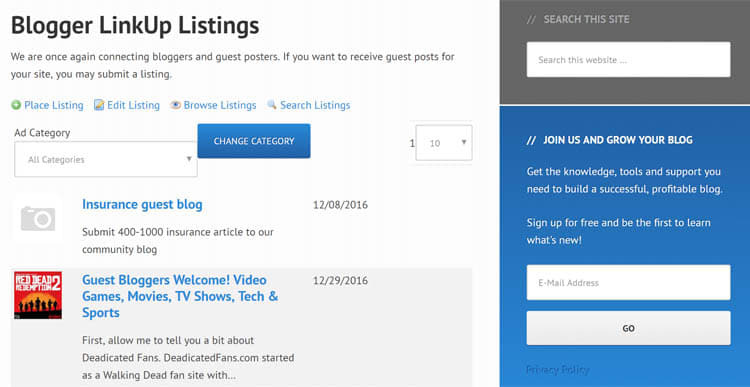 There are fewer opportunities in this channel compared to the booming community it was some years ago, but it’s still online and still functions as a place to source for possible guest posters to your site. Be prepared to sift through some bad candidates and do a bit of editing. Post Joint is another place to get free unique content for your blog, Post Joint connects advertisers with blog owners. 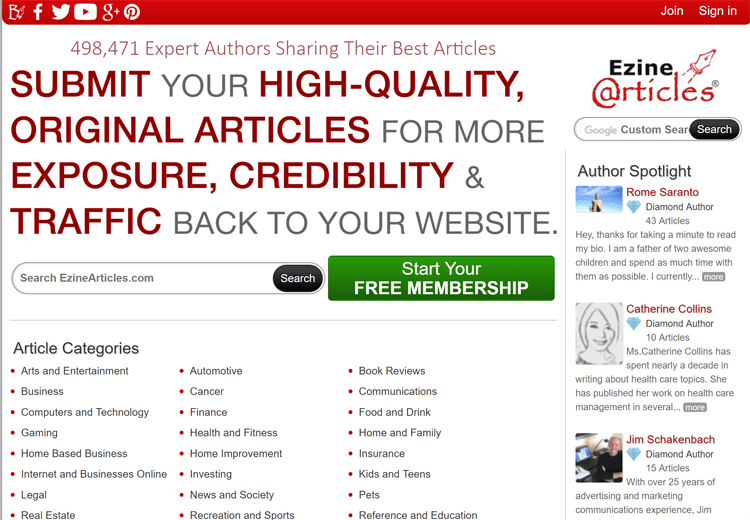 Advertisers produce quality content and bloggers offer to publish their guest posts. Post Joint streamlines the prospecting process, matches the audiences up, and takes care of quality control. Update 2018: PostJoint is no longer free but still has a free trial with no credit card requirement. My Blog guest (MBG) is an awesome community of bloggers and guest bloggers who are willing to give you their unique contents in exchange for a link from your blog. It is own by Ann Smarty, a well-known blogger, and social media user. This site has a lot of users and you will usually find an article that will suit your blog no matter your blog niche. Content BLVD lets you join their content service network, and you can browse through their content gallery to find posts that interest and suit your niche. Make your offer, and if it’s accepted, you get the unique free content. Update 2018: Content BLVD’s website no longer exists, and the company has since been rebranded on Youtube to become a market where advertisers and content creators can create partnerships. Post Runner lets you get guest posts from various authors in exchange for backlinks to their website of choice. Like MyBlogGuest, Post Runner also has a WordPress plugin that makes accepting and managing guest posts easy. Update 2018: Post Runner is no longer free to use. As of this writing, this website is no longer online as well. Wikimedia Commons is a treasure trove of multilingual media that you are free to reuse. Much like Wikipedia’s premise of non-profit, crowdsourced content, all content on Wikimedia are free for anyone to use and contribute to. 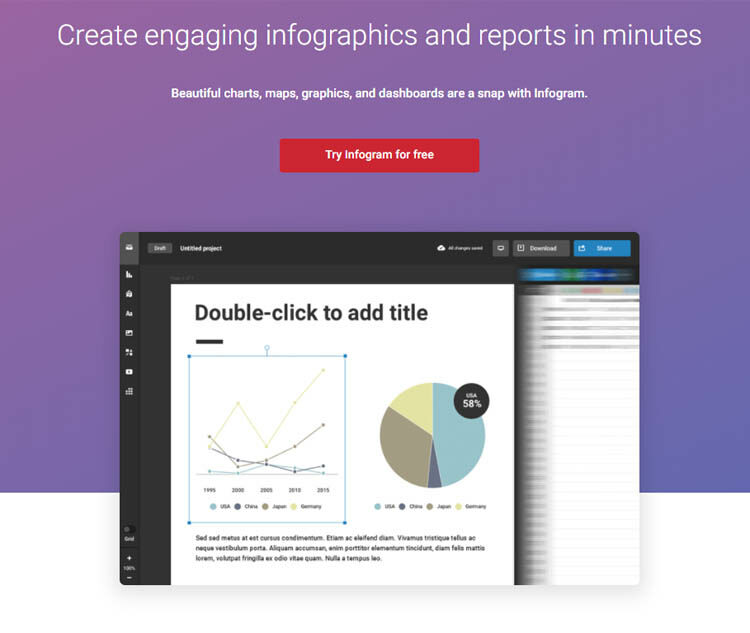 If you’re looking to add more engaging visual data to your content from infographics, charts, maps, social media visuals, and more, Infogram is the place to go. It’s free to sign up, and you’ll be able to get access to all the public use content, upload 10 images, create up to 2 maps, and 10 projects. But if you need to create more than the amount allowed for free users, then you’ll have to upgrade to their paid plan. For free images, vectors, illustrations, and videos to add spice to your articles, Pixabay is one great resource. You are free to edit and reuse even for commercial purposes. The pictures are beautiful and high quality that it’s hard to believe they’re free. Some images are published with the Shutterstock logo, though. Marketing Shutterstock’s paid image services could probably be one of the site’s sources of income, so no harm done there. The noun project is an online resource for over a million icons curated by users worldwide. There is an extensive library of free icons. But of course, if you want more, there are themed kits that you can buy from their shop. 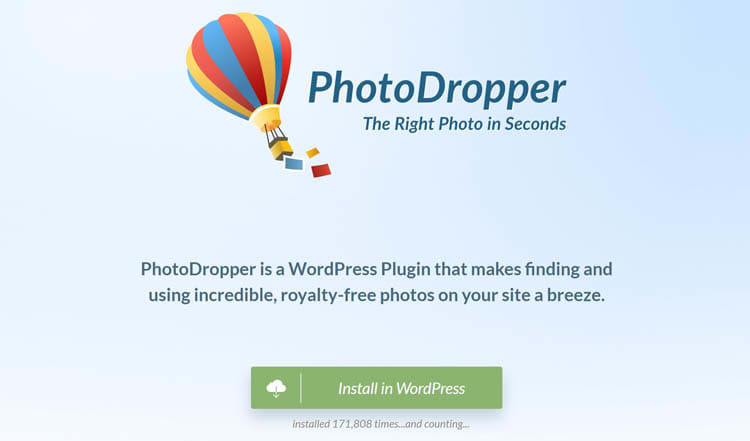 If your site is hosted on WordPress, then you can also use PhotoDropper, a WordPress plugin that helps automatically add rights-free images to your posts. PhotoDropper scrapes from Flickr’s millions of creative commons images and is, at the moment, working to add more data sources. The Web Archive, or the Wayback Machine, is an online archive of a ton of things—any type of media that you can reuse into blog content for free included. You might think the Web Archive hosts only old stuff, but in fact, it’s a growing online repository for plenty of things you can reuse for content. Atlas is a free data visualization resource powered by the online publication Quartz. Reusing the visually represented data from Atlas could be a good way to add more credibility to your posts. 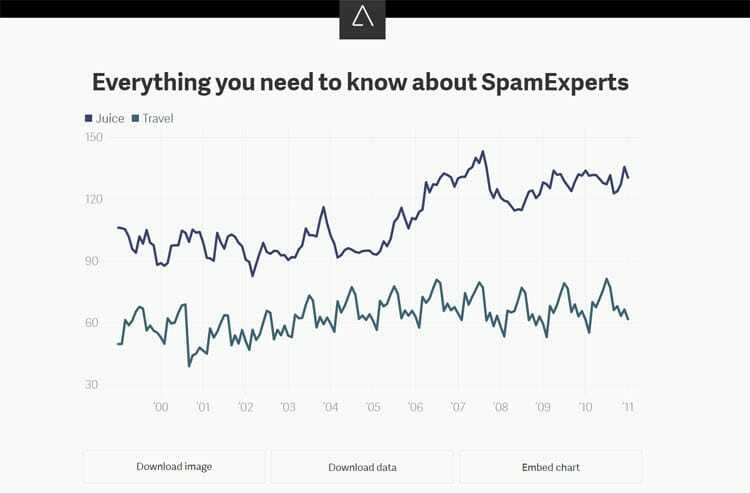 Here’s an interesting chart I found about “SpamExperts” when I searched for “marketing” data. Perhaps one of the more user-friendly web-based graphic design tools, Canva makes for an excellent resource if you’re looking to create unique images and visualized quotes for your blog content. 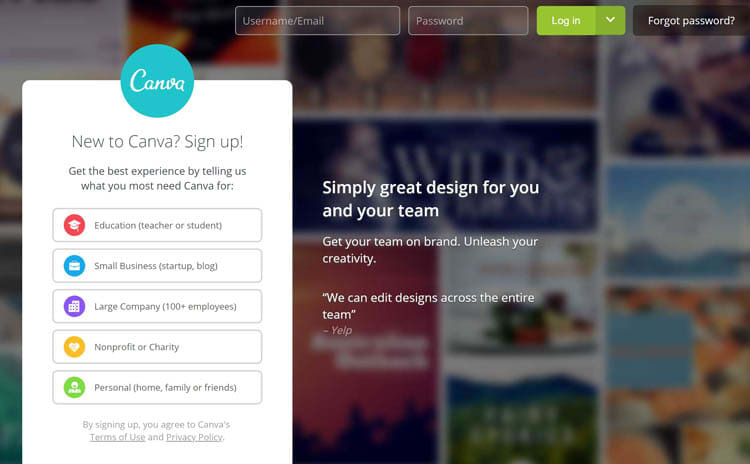 Canva is free to use, and you only need to pay for added features and copyrighted images. If you’re looking for more advanced graphic design features that are still easy to maneuver for a non-pro graphic designer, then Snappa is a good choice. For five free downloads a month, you can use Snappa to add better, personalized graphics to your blog for free. 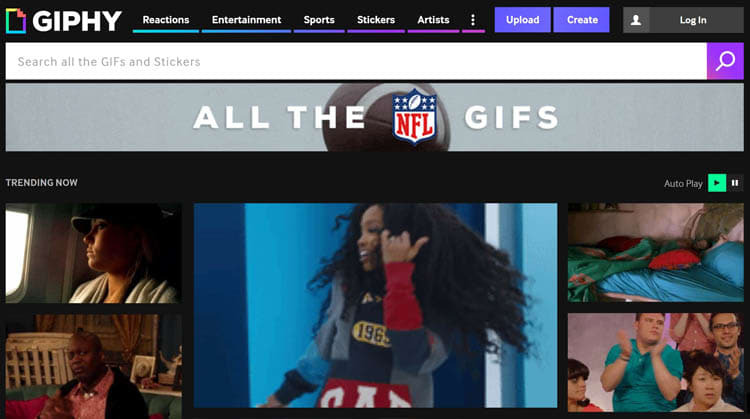 Personally, we’re not too keen on using memes in our own articles, but if you’re ok with adding memes and gifs to your content to add some fun, especially if it fits your niche, then Giphy is the free resource for you. You can even upload images and create your own memes—for free! Now that I think about it creating a meme about guest posters who don’t read Write for Us guidelines and complain about getting rejected seems like a good idea. Guest posting is a practice I’m sure you already know. It’s when you submit free blog content to be published to a good website in exchange for a free dofollow/nofollow link or exposure. So if you want a regular source of free blog content for your site, you should open up a Write For Us page, which will let bloggers know of your requirements, the topics you cover, what they’ll get in exchange, etc. Of course, to get any interested blog contributors, you first need to have a good, non-spammy website with decent Domain Authority (DA). The higher than 30 you go, the more guest blogging proposals you’ll get. So make sure to build good DA and reputation for your site. You can also proactively reach out to influencer bloggers in your target niche. This would typically take you some time in prospecting and outreach, and we have done it before, which is why we developed NinjaOutreach to help speed things up. 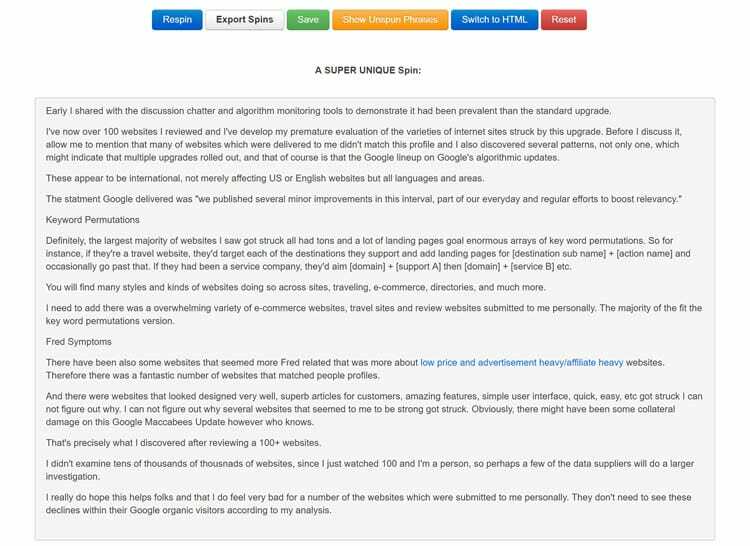 Expert roundup posts are a superb content marketing trifecta: you get to open up a dialogue with influencers in your niche, you get free blog content, and you get a highly linkable asset. Most bloggers want to participate in expert roundup posts because doing so also gives them exposure as well as a backlink. All they need to do is give you a few sentences of free content. An efficient quid pro quo. To start, open an influencer prospecting tool to look for other high-performing roundup articles in your target niche and make a list of the experts who participated. Create a survey form with your interview question and send these out to your prospects. From our experience, a good rule of thumb is to send to at least 250 to 300 people if you want to get at least 50 responses. The more responses you want, the higher your prospect pool should be. Once responses start pouring in, you just curate them, add an introductory sentence or two, even a paragraph, if you’re so inclined, and voila, a whole new article for your blog, for free. Here’s another example of how to create content from crowdsourced content. Rand Fishkin asked people to send in their advice on how to rank a webpage in 2018 in 280 words or less. He picked the best ones from the responses he got and turned these into a Whiteboard Friday episode about how to do SEO in 2018. Instead of spending hours researching and then putting together an article, why not interview an expert in your niche? 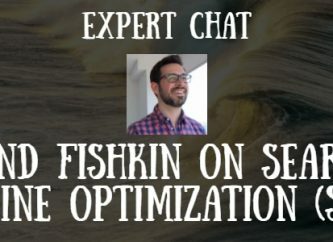 In our case, we were able to host a chat interview with Moz’s Rand Fishkin. Instead of manually researching on the web and writing things down ourselves, we went straight to an authoritative source and asked him our burning SEO questions. And his responses? Turned to instant free blog content! Newsjacking is when you convert major news into an article. It’s not new, but it deserves a place on this list because so often, other bloggers forget to use this tactic. Also, when you ride on the coattails of a trending topic, the timeliness, even controversy, that surrounds that news, could help you promote your content much faster than writing about stale topics. For example, instead of having to manually research and put together a lengthy article about SEO, we went deep into a then-hot news topic: Google’s latest search quality evaluator guideline updates. We opened up Google’s guidebook, summarized, and wrote concise, TLDR descriptions for their quality guidelines along with our short analyses. Ultimate resource lists are easy content pieces to put together. Like expert roundup posts, they are very linkable, and are easy to rank because of course, people like massive lists of the things they need! Take for example our ultimate list of 200 SEO tools—it’s not easy to try everything out in one go, so it’s a page worth bookmarking and spending some time on. How to make one? Simple. We made a list of all the top SEO tools using Google and a handy scraper. Next, we put everything on a list and, for the descriptions, simply used any available meta descriptions of each tool. You can find those on their webpage or business pages. If anything is grammatically incorrect or not very reader-friendly, we edit. This is significantly faster than if we’d written the 200-item list from scratch ourselves. This is much like creating an ultimate resource list except, in this case, we’re curating web pages—blogs or articles. 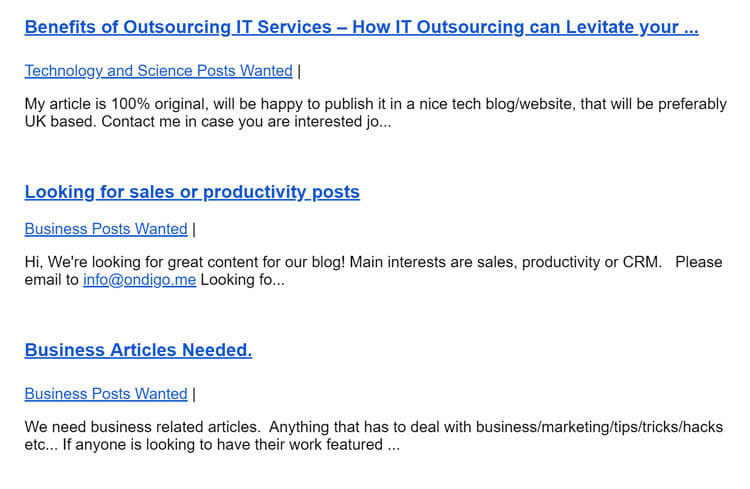 Take for example this list of top business blogs that we published. Again, much like creating a resource list, we looked for the top blogs in our niche via BuzzSumo and NinjaOutreach. We then manually whittled down our list by DA until we came to a final number. Now instead of whipping up an article from scratch, we were able to make free content for our blog just by curating a list of our recommended business blogs and adding short descriptions for each to guide our readers. Repurposing multimedia into text content is nothing new, but it’s another item on this list precisely because of how ingenious and straightforward it is to execute. You can just pull up trending Youtube tutorials, podcasts, and online courses. Next, you can break these down and turn each section into outlines for your article. 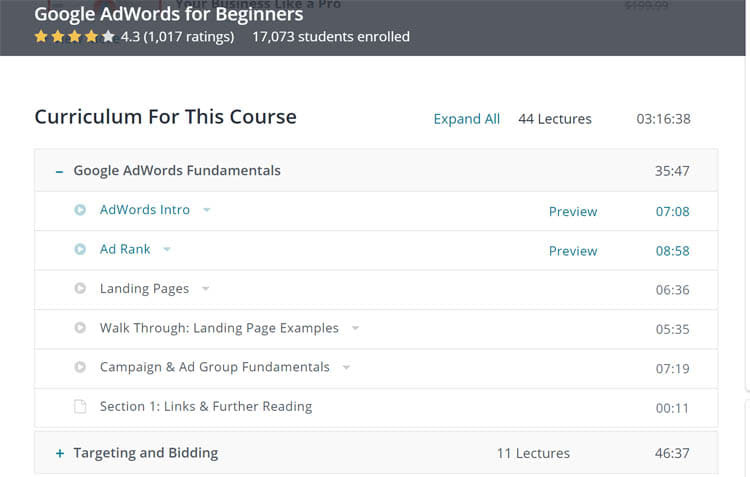 For example, if you want to write about Google Adwords, you can do a search for one of the top courses online about this topic. Check out the curriculum, and you’ve got yourself an instant article skeleton. If you’re watching a free course or something from Youtube, you can just skip through certain parts and adjust the playback speed so you can quickly harvest the meat from each section and put those into your article. Another way to get more free blog content is to analyze already published articles and split those that are too lengthy or forced into two or more pieces if those are not semantically related. There are more ways you can go about this as well. The web is also a vast graveyard of defunct websites, and what you can do is to harvest some free blog content from these sites and publish any so-called orphaned content that you can use. Once you find anything that looks good, see if you can improve it, then simply republish. It will do little help for SEO but finding good content may help your readers, so you can hit republish and just add a “Noindex” tag to be safe. Translating your popular content into English/other languages can be almost another way to create free blog content for your site. So check out your Google Analytics and see if you’ve got any visitors from other countries. If you’ve got a good portion of visitors from France, for example, it would probably make some sense to translate some of your popular content into French. Fact: we published a Spanish translation of one of our most popular articles, 500 Ways to Make Money Online. Creating curated content is also known to generate virality. Listicles such as “Top articles/videos/discussions/infographics/statistics/studies” you should look at today typically get a lot of engagement and traffic, from our experience. Take for example our curated list of SEO tools and beauty blog influencers. Even Hubspot created a dedicated page just to curate top marketing statistics. Just look at all those referring domains on Ahrefs. 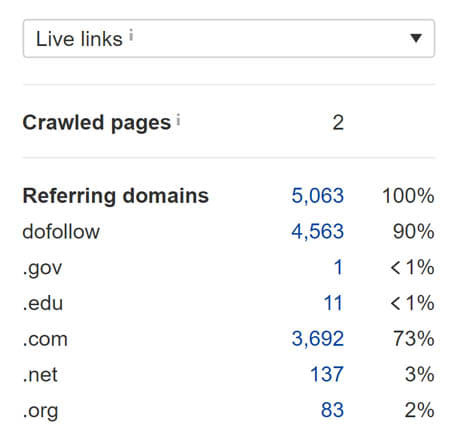 There are even 11 .edu backlinks in there and one from a .gov domain. Hubspot’s example just shows how curated data seems like an excellent way to make not only free but credible, linkable assets. To help you gather the content that matters to you, here are some free content curation tools you can try. Note: Not all of these tools are completely free. Some are freemiums, where they have a premium and a free version. The ones we included in this list are tools whose free versions are actually usable. HARO is a Q&A site for journalists and writers and is something you can use to crowdsource answers for your blog content for free. Sign up for the service and choose your category. Then send out your questions. These will be sent out to HARO’s other subscribers, who will then choose to respond to your answer and provide you with content that you can quote and use in your article. If you can get blog content for free, then nobody should be paying any other professional or agency for content, right? And yet, people still pay to buy articles for their blog. 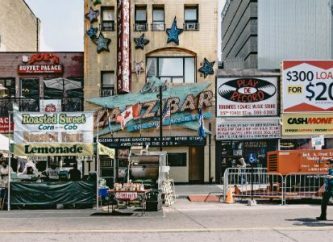 In this section, we want to show examples of paid tools and services that demonstrate why, despite the existence of free options, most credible businesses still choose to shell out cash to buy blog content. 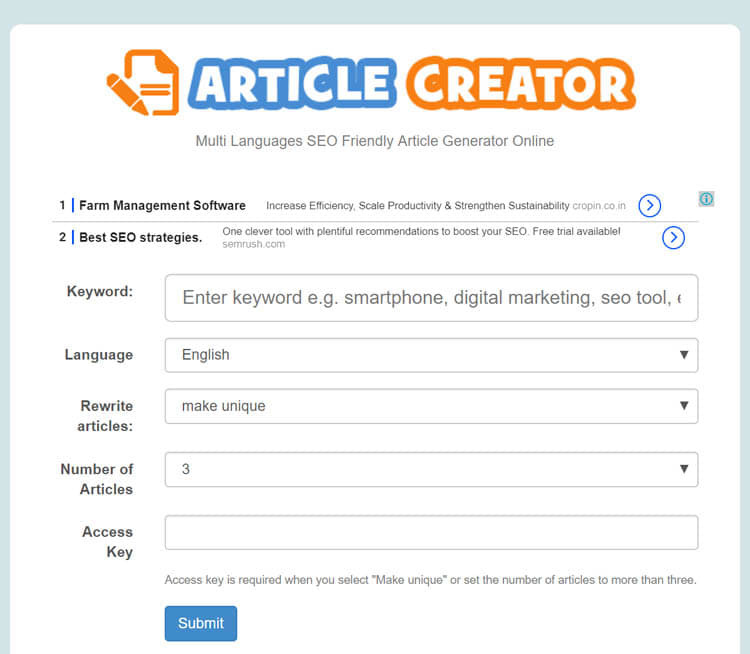 Unique article creator refers to itself as a multilingual, SEO-friendly blog content generator. However, if you want 100% unique content, you’re going to have to pay up. It costs $4 a month for unlimited article rewrites. Again, the quality of these articles leave much room for improvement, so you’ll still need to edit to make them unique and readable. This functions much the same way as the Article Creator, where you need to put in your keyword, and it scrapes content online that you can use. If you have a premium key, the tool can then rewrite this content for you and make it unique. As mentioned before, content obtained this way usually will still need a human editor to make them readable and natural. Pop these into Grammarly and correct anything too glaring in terms of grammar, word usage, and style, and once they’re readable and plagiarism free, then you’re good to go. This should take you at least 30 to 120 minutes. You can also link other accounts such as Copyscape to ensure uniqueness and WordAI for word-spinning. Unfortunately, even after signing up and even paying for the service, I still can’t generate a usable article from the service. I’ll update before my subscription ends (in a month) if I can get any results. 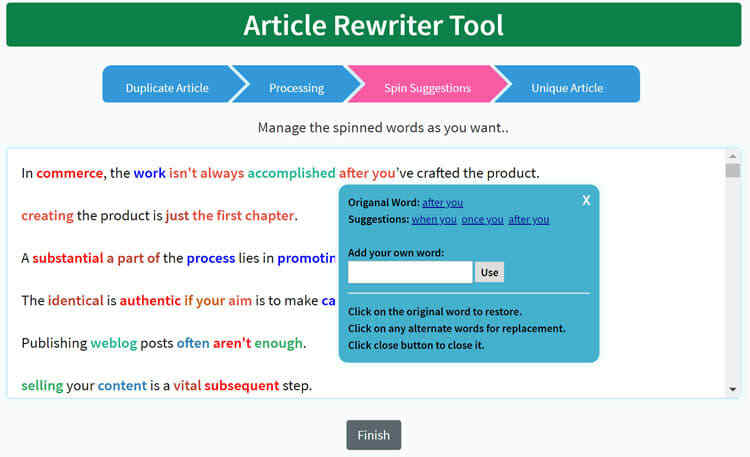 Articoolo is a pay-per-use article generator and rewriter. If you sign up for an account, you get free credit to try out the tool. You’ll need to set your preferences though, and the maximum word count is only up to 500 words. After a minute or few, I finally got my free, auto-generated article. If you read it, it’s actually pretty amazing. The writing is contextual, and I can say it’s the best auto-generated content I’ve seen to date. However, it still missed the actual topic I wanted to write about. It also talked at length about multilevel marketing, which is far off base from the topic I indicated. If you think there’s potential, below is the price list. 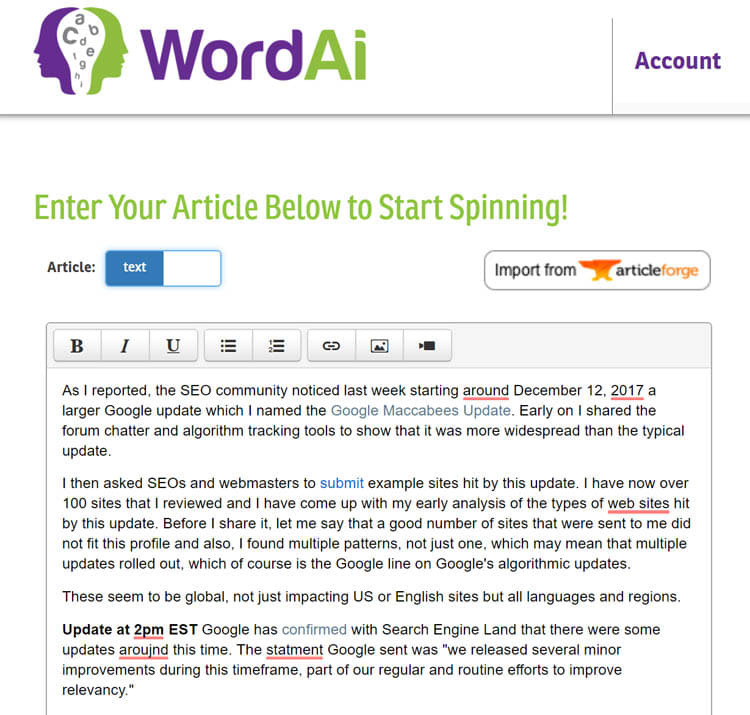 Next up is WordAI, an article spinner tool. There is a free 3-day trial, and after that, you get charged $49.95 per month. If you go over 10,000 words, you get charged an extra $2. Below is the original text that I pasted onto the tool. It’s the Google Maccabees update analysis on seroundtable by Barry Schwartz. First off, they’re still unusable as is. However, they’re definitely much better and easier to edit compared to the first free article spinners I listed in this article. In case you were disappointed by the previous content generator tools we looked at, these next ones in the list may surprise you. There are actually much higher-tech tools that have produced near human-quality content. These tools are able to pore through reams of data, make an analysis, and publish a narrative much faster than a team of humans can. They are powerful, and the most expensive ones on this list. If you think this is all just marketing speak and, that when we actually test the tool, we’ll get the sad results we got from the previous generators we tried, then you may be wrong. No less than the Associated Press has already used Wordsmith for their publication. 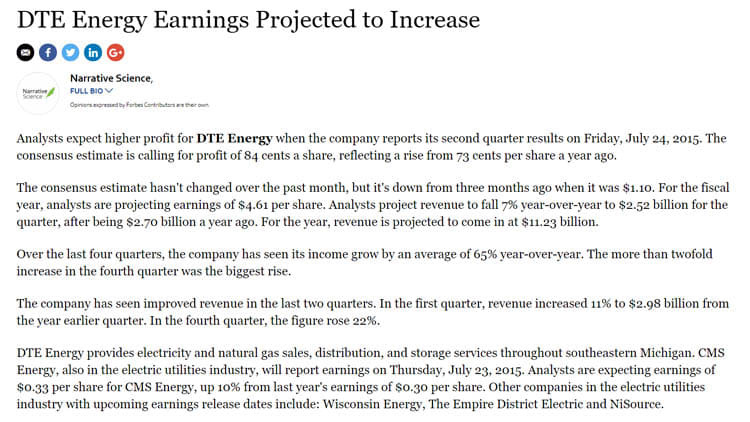 Below is an example of an article Wordsmith wrote. No glaring errors there, right? Now click here to see more AI-generated articles that will make you think twice about whether it was really written by a machine or not. Quill by Narrative Science, is Wordsmith’s competitor. So fundamentally, they work the same. Like its competitor, Quill also has an impressive clientele of Wall Street bigwigs the likes of Credit Suisse, Deloitte, MasterCard, and PricewaterhouseCoopers. 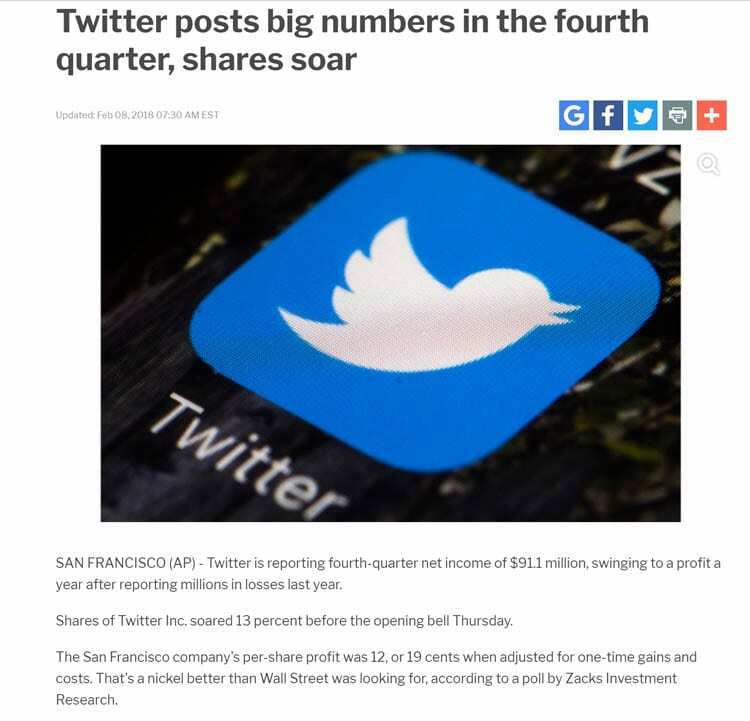 Oh yeah, Quill even has an author account on Forbes Magazine, where you’ll see all of its AI-generated articles on sports and earnings reports. Below is an example of what Quill wrote. Impressive as well, right? Unfortunately, all that comes at an impressive price. At the moment, I can’t report on how much it all costs, because these companies only have demo scheduling instead of pricing pages. Perhaps, to leave the cost to the imagination, and to open the door only for those who dare venture close. 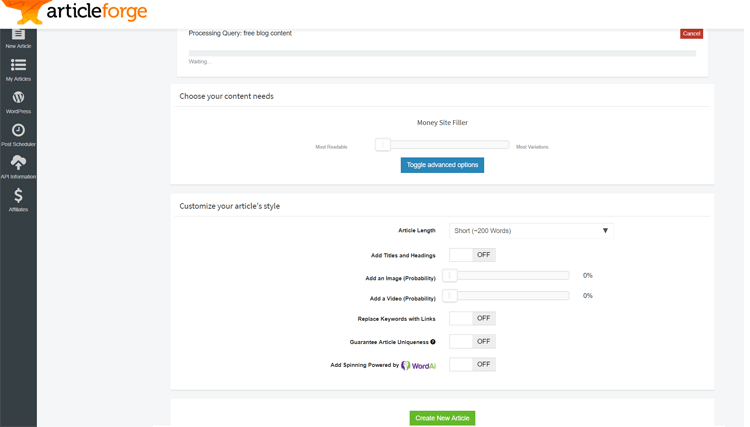 So now you’ve got all these options to generate free content for your blog. We’ve even gone ahead and gave you some paid examples, too! Just remember, free blog content can work—just be careful where you use it for so you don’t get your site and your business’s brand reputation in trouble! This article was originally written by Dave Schneider, NinjaOutreach Co-Founder and CEO. It has since been updated by Hazel Mae Pan, NinjaOutreach’s Content Manager.